Junior School Programme. Welcome to our blog! 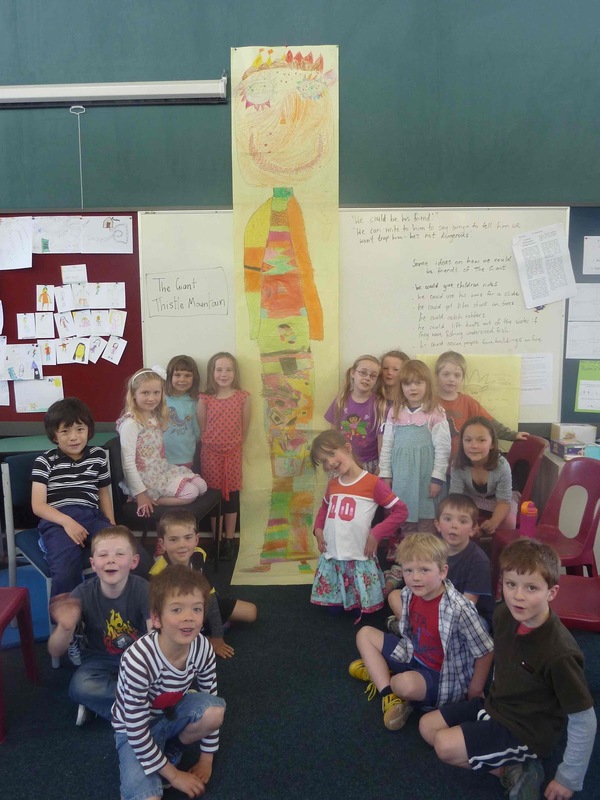 This Mantle of the Expert unit of work is with a group of year 1 and 2 students at Muritai School. 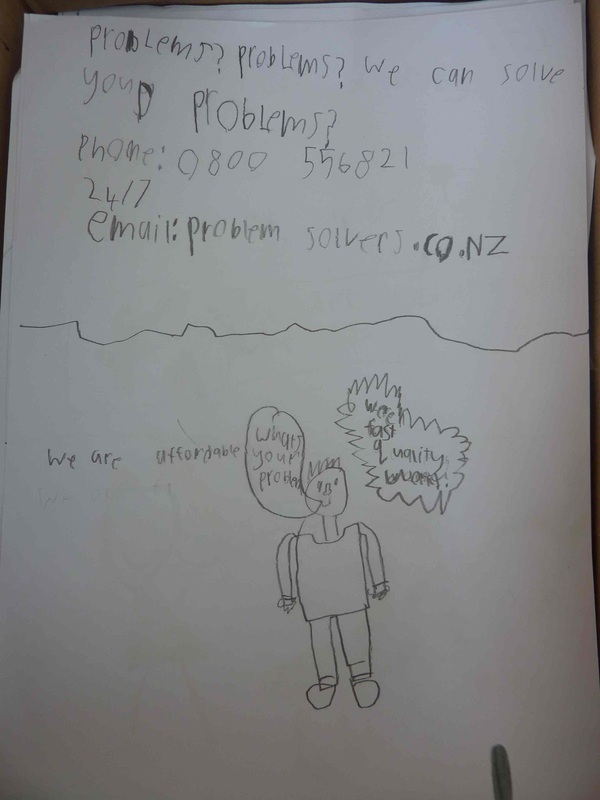 Our inquiry topic is helping others and we are going to be thinking about the key question: “How do we get our problems solved and help others to solve their problems?”. We are going to be working together for the first five weeks of this term every Wednesday. We are going to spend time in role as people who work for a helping company. We are going to do a different drama each week where we will help clients, such as Old MacDonald, solve problems. Each week we will also be doing a range of activities to help develop our drama skills and our co-operative learning skills so that everyone can successfully participate in the team and work collectively in the drama work. 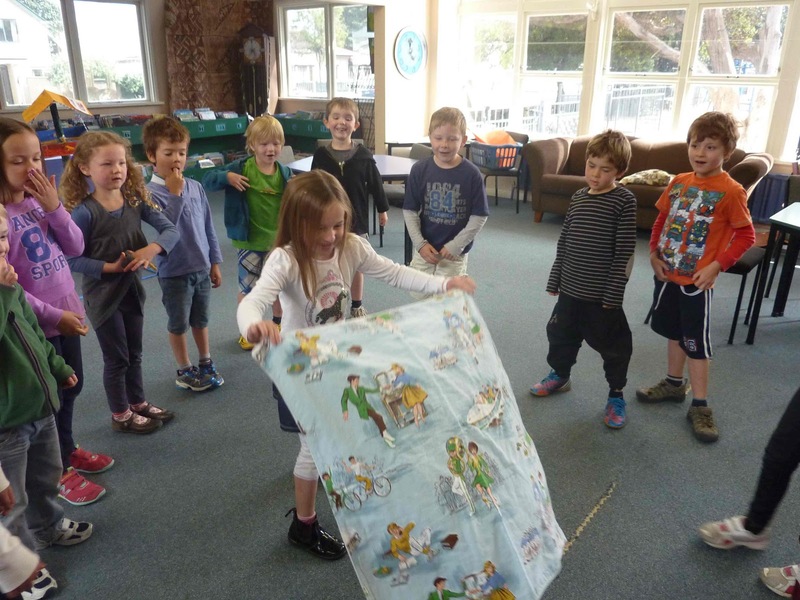 As part of this skill building we will also spend time every day doing music in the Orff Schulwerk approach, which will involve singing and moving, as well as some simple ensemble work on untuned percussion instruments. 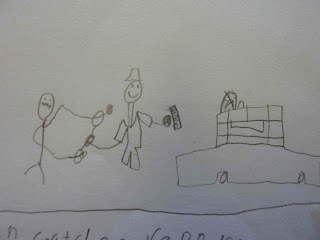 You can read more about both Mantle of the Expert and Orff Schulwerk by clicking on links on this blog. 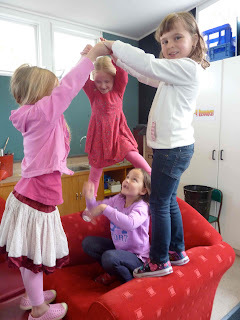 Today we started with learning a circle dance game to a song called 'A Let A Go Go'. This is a traditional song from Trinidad and lots of fun. 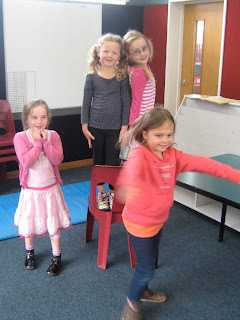 We had to learn a clapping pattern and then we moved around the circle, changing clapping partners as we went - it was a fun challenge keeping up with the song, which got faster and faster as we got better at it! 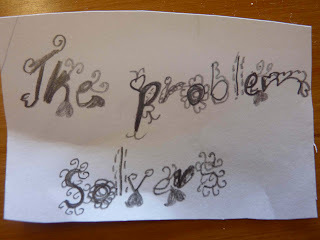 Our drama work started with getting into role as 'The Problem Solvers'. 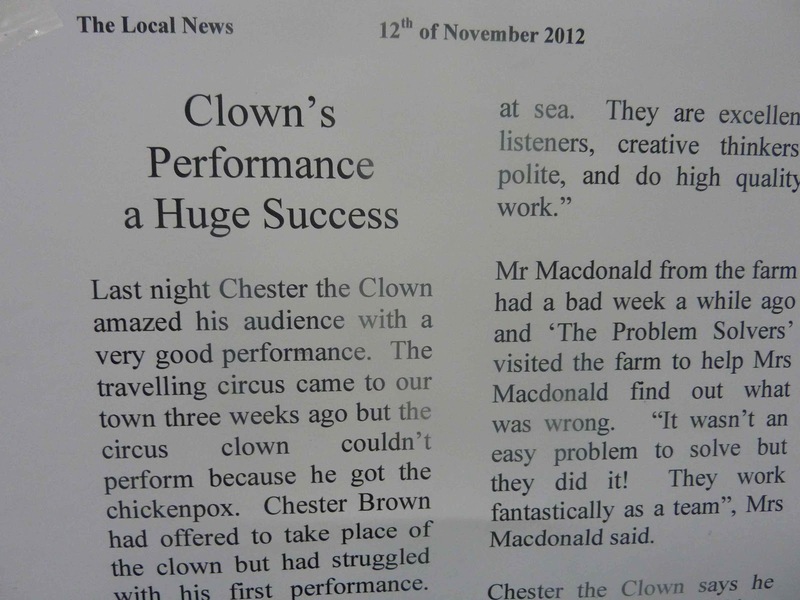 First we share read a 'newspaper article' about the clown we had helped a couple of weeks ago. 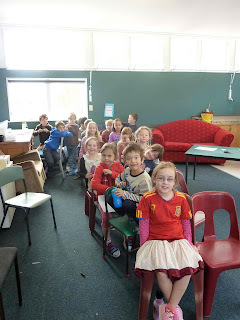 We learnt that his performance had been very successful and that the audiences had fallen off their seats laughing. 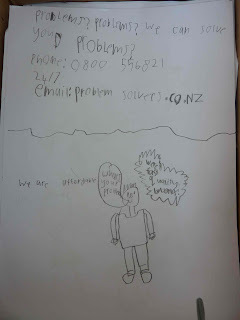 The article talked about 'The Problem Sovers' work over the last few weeks and had interviews with the different people we had helped including the Grinlings and the MacDonalds. 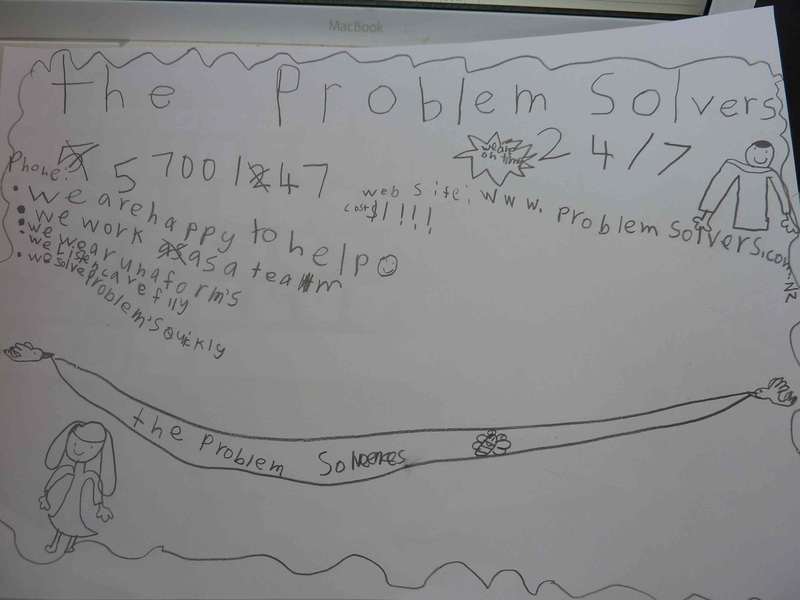 The article was very complementary about the work of 'The Problem Sovers' and reinforced all the skills that the team had! 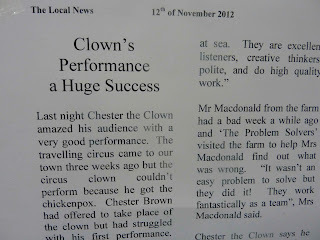 Newspaper article about the clown we helped a couple of weeks ago. Out of role we talked about our work with the Giant of Thistle Town the previous week. 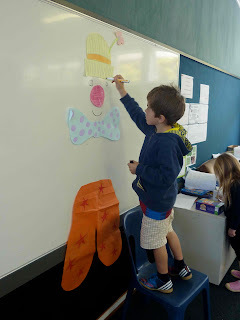 We created a 'Role on the Wall' for the giant. 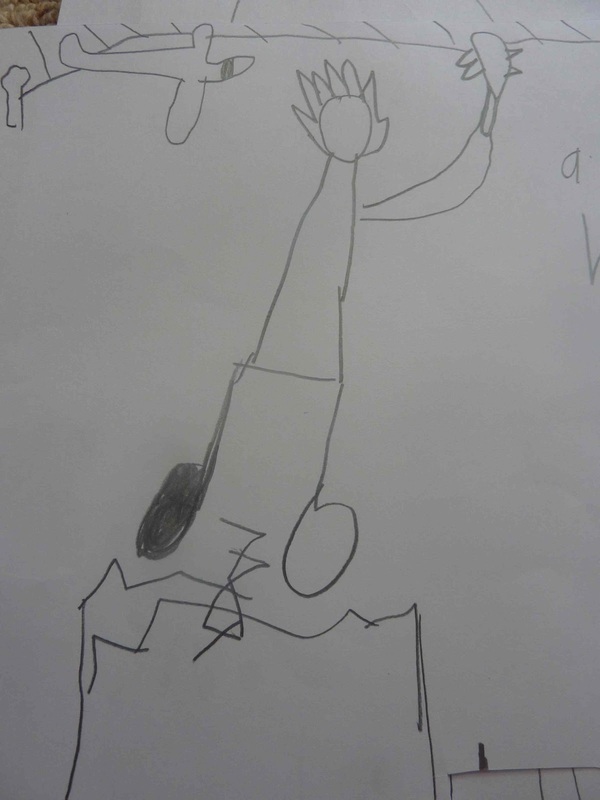 Tom drew us an outline of the giant and on the outside we wrote everything we knew about what the giant looked like and behaved like On the inside we wrote down how the giant felt - i.e. angry, sad, frustrated. 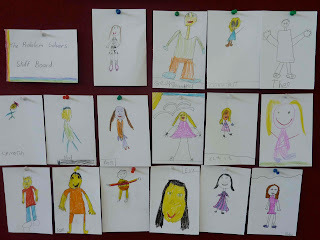 Later on in the drama we added to this 'Role on the Wall' as we learnt more about the giant. 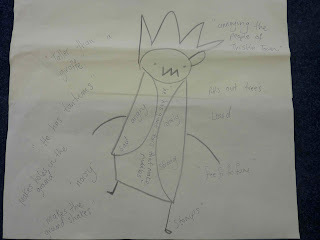 Our role on the wall for the giant - drawn by Tom. 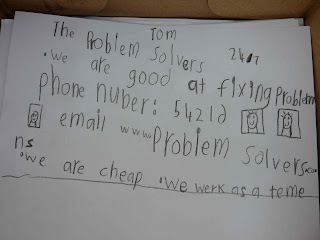 Back in role again as 'The Problem Solvers' we received a bundle of letters - there was one for everyone (the letters came in the envelopes we had self-adressed last week). 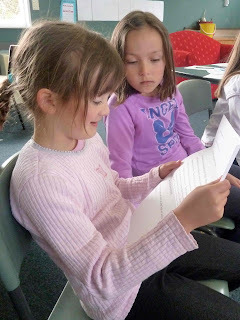 We opened the letters and share read them together. 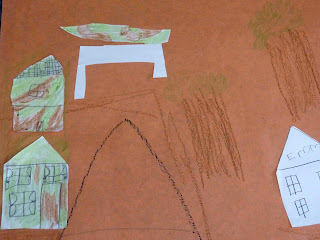 We learnt why the giant was sad and cross and even found out that he hadn't been taking the animals from the town, which some of us had suggested last week. The animals had been visiting him and he had made friends with them. It turned out he was a sad and lonely giant who needed some help. He was feeling frightened and frustrated, we could tell by his cross giant words that he was very unhappy. However, he didn't trust 'The Problem Solvers', he was scared of us - what were we going to do? Was there a way we could still help? 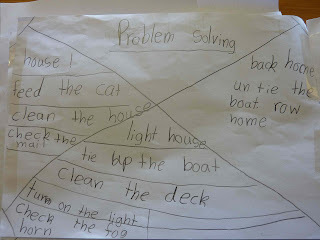 The letter stimulated a great discussion and lots of creative ideas and problem solving. 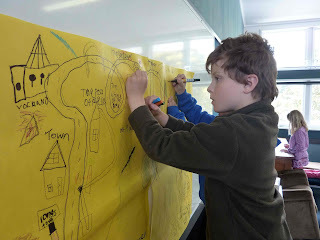 We added what we now knew about the giant to our 'Role on the Wall' - we now had a more accurate picture of our giant. I don't know why you are picking on me! Tanglebangled ringlepox! I'm just a lonely old giant and nobody seems to want to be my friend. Sometimes the animals of the town come and see me and they seem to like me. They curl up in my cave and I sometimes give them nice food to eat. But no one else has ever visited me or invited me to do something with them. What have I done to hurt you? I know you've all been talking about me and my tantrums. I can't help them can I? Don't you throw tantrums - you wagglepooping nurdlecrists? I want to meet with you to talk about this. Keep those franglewhangled whippersnack Problem Solvers away from me! They just want to trap me or put me in a cage and take me away from my home. How would you like that? I don't and I'm frightened. Everyone reads their copy of letter from the giant - shared reading aloud. We aren't bad people we are sorry. We just want to be your friend. Would you want to have a party on the mountain? We would all come. We are sorry we made plans to trap you. I know a little plan to get you some friends. You can have fish and chips with us on the hill. We are so sorry for planning traps and stuff. Please forgive us. We want to be your friend. We'd like you to visit our home at the bottom of your hill. There is a town and we'll tell the people to be your friend. You could do slides for us with your arms or we could jump off your arms. It would be fun. 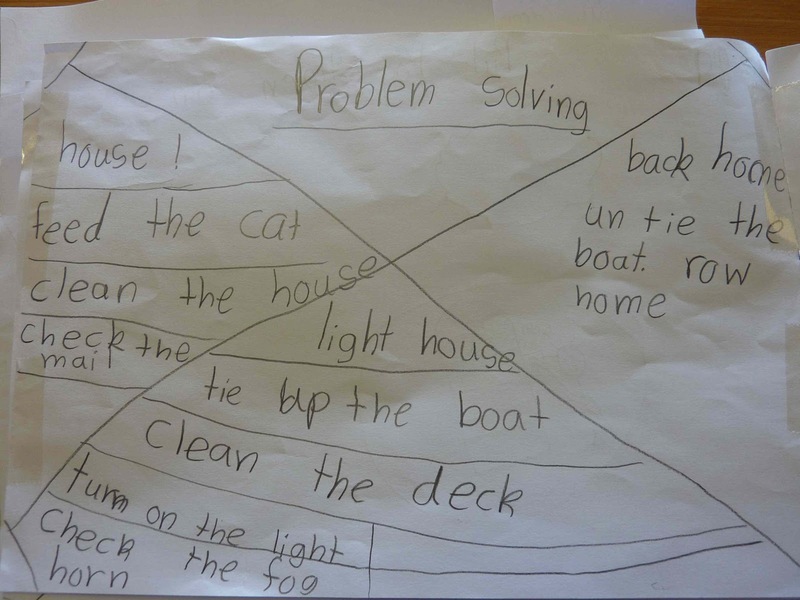 We are sorry that we came up with all the trapping ideas. We have come up with new ideas. Here they are. You could help the police help the firemen, or the fish-dumping police. We want to be your friend. We will take you to the fireworks. We are sorry for trying to trap you. 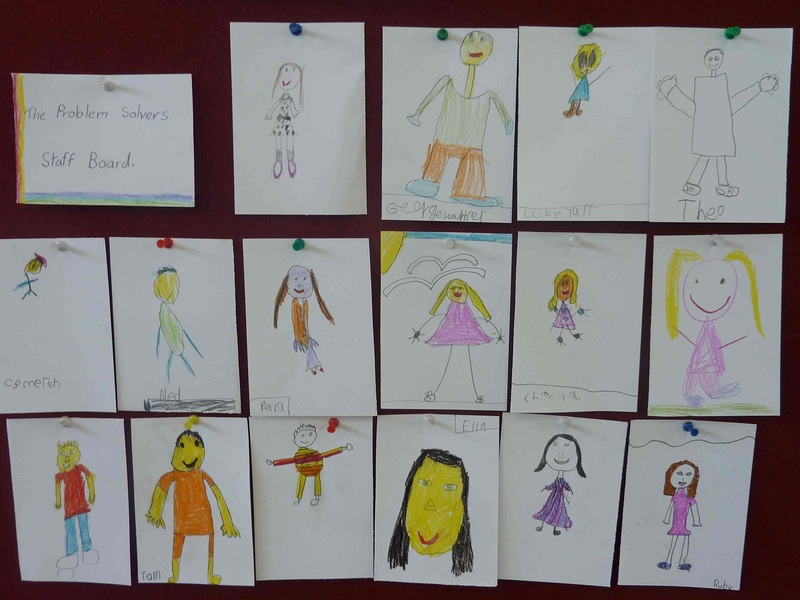 You are friendly and could help Thistle Town in lots of ways. 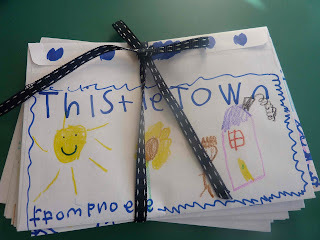 Here are some things you could do: you could be a ladder for firemen, a catcher for robbers, and a net for fishermen I hope you can help the town. We want to make friends with you. Don't be angry at us. We are going to change our plans. We like you. 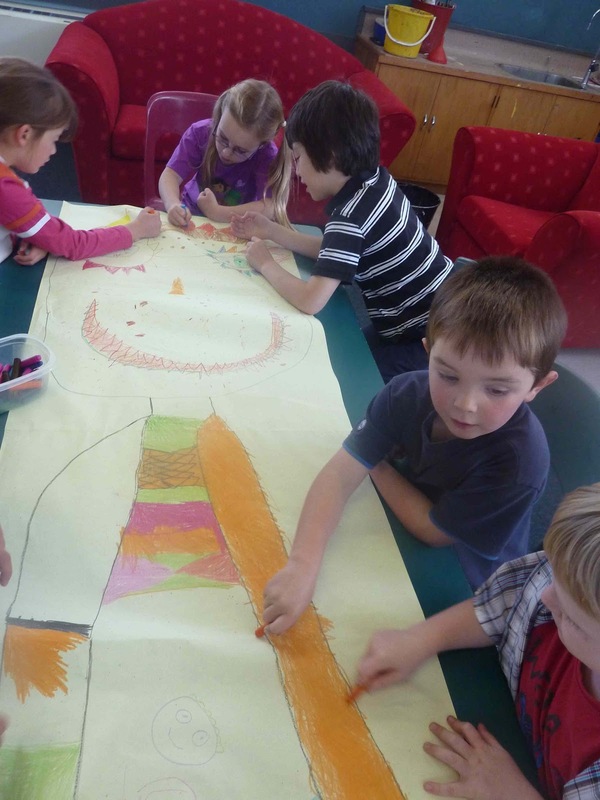 When we had finished our letters we decided we would invite the giant to a meeting in Thistle Town so we could give him our letters and tell him we wanted him to be his friend. We then needed to make a giant! We collectively drew a huge giant on to a long strip of paper - we all worked together to create a fabulous HUGE giant. The Problem Solvers and the HUGE giant! 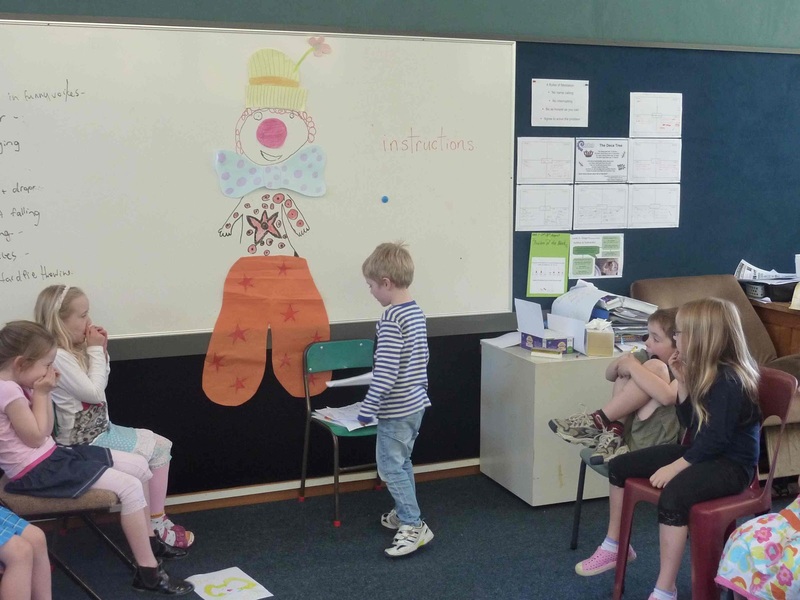 To finish our drama work today we hung our giant on to the wall and the set up the chairs in a semi circle around him. 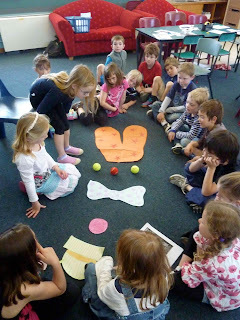 We then used the drama convention 'a ritual' to present our letters to the giant and to say something to him. We stood up one at a time to present our letters, which we placed at his feet, and we all thought of something really nice to say as we did this. It was a lovely way to finish this drama. 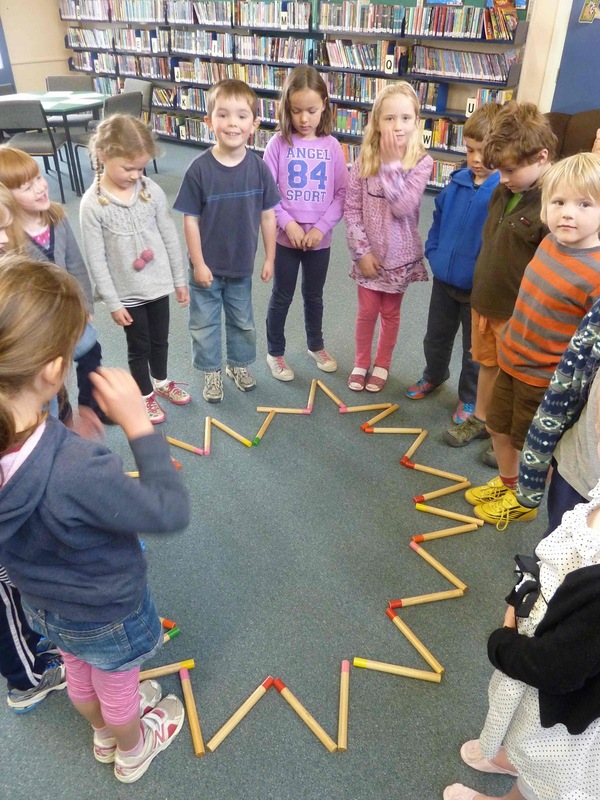 Today was our last day together as 'The Problem Solvers' To end our five week unit of work we made a porporoaki (a reflection circle). We all stood in a circle, facing outwards to start with. We thought of something we wanted to share about our work and when we were ready we quietly turned to facing inwards. When everyone had turned in we went around the circle and shared our thoughts. There were lots of favourite moments shared. 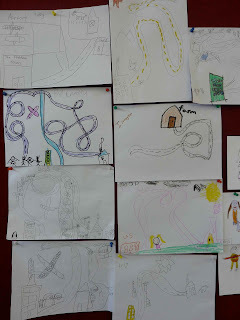 Collective mapping and drawing, learning lots of songs, meeting the different characters (teacher in-role), travelling in planes and hot air balloons, making the moving lighthouses, and getting letters from the different characters were some of the favourite moments that were shared. 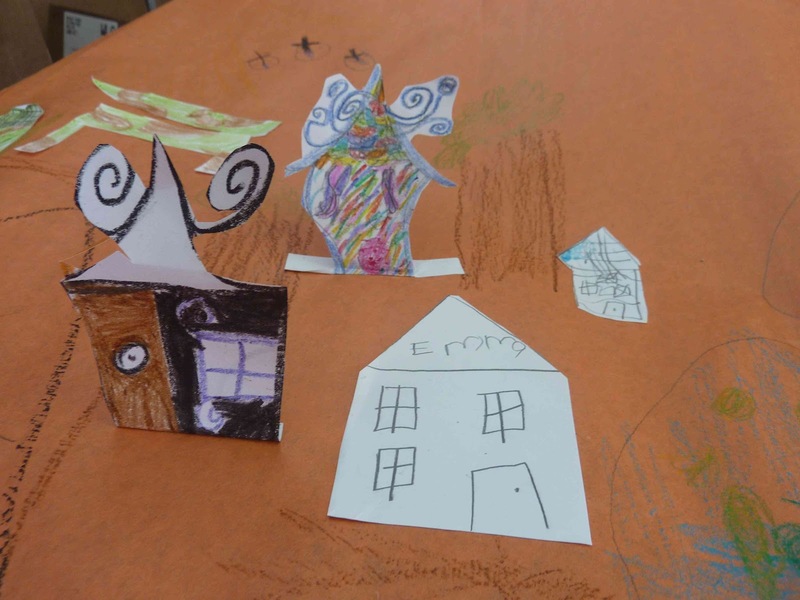 In five weeks 'The Problem Sovers' have become a fantastic team of co-operative creative thinkers and have learnt to play together wonderfully with lots of learning along the way - well done team! LITTLE JOHNNY BROWN, LAY YOUR COMFER DOWN. Today we started with a traditional American song called Little Johnny Brown. 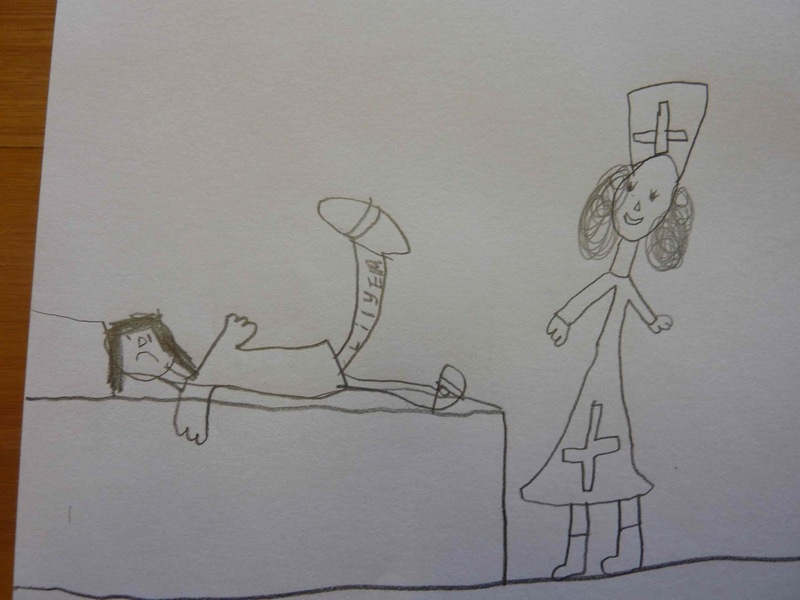 We all had turns at being Johnny Brown with a blanket ('comfer') in the centre of the circle. We moved to the words of the song folding the corners of the blanket one at a time then showing everyone a movement to copy before passing it to someone else - lots of fun and a very catchy song! Little 'Lily' Brown lays her comfer down. We also learnt a stone passing song from New Guniea called 'Mal, Mal, Mal'. As we sang this song we had to move rakau sticks around the circle in a pattern - this was a challenge and it took a lot of practice to get it right. We also sang and moved to our potato song and Jambo - everyone is really enjoying the music and singing, and it is a great way to start the day. 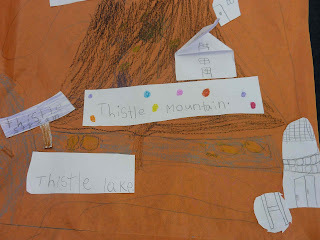 Our drama today began with a story of a little child who sees a giant throwing a tantrum on a mountain called Thistle Mountain. 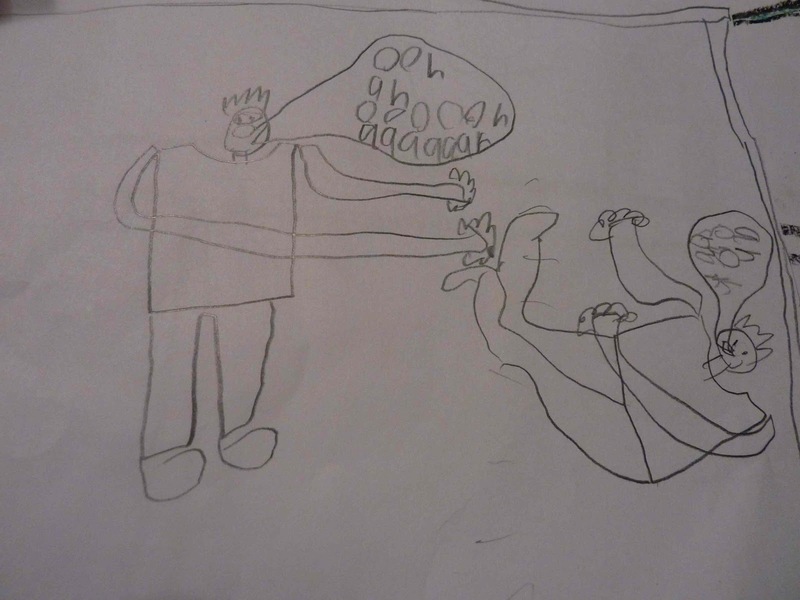 The child hears the giant bellowing words like "tanglebangled ringlepox!" and sees him banging his head against a tree and throwing branches. 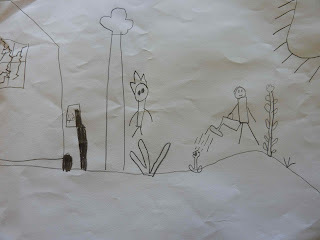 The child hurries home and tells the people of the village "I just saw a giant throwing a tantrum!". 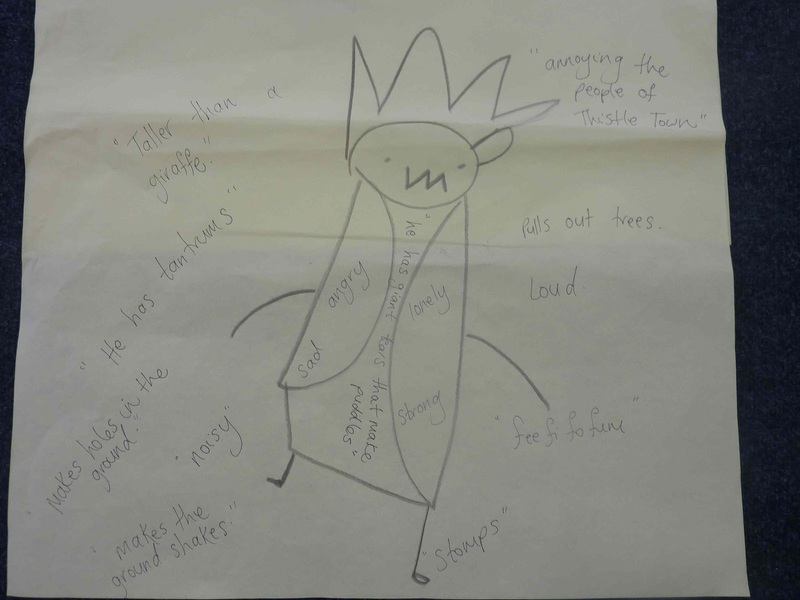 After this story we gathered our ideas about what tantrums are and we all shared stories about when we had seen or heard a tantrum. 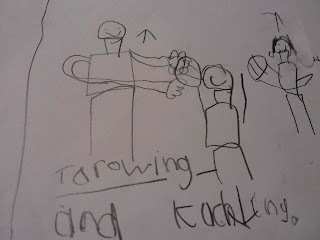 We discussed why children throw tantrums and how you feel sad/frustrated/angry when you throw a tantrum. 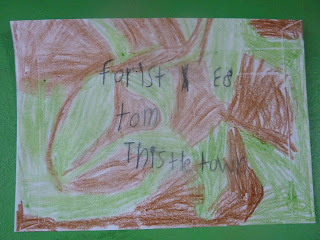 Next we listened to a description of the village by Thistle Mountain, a place called Thistle Town. 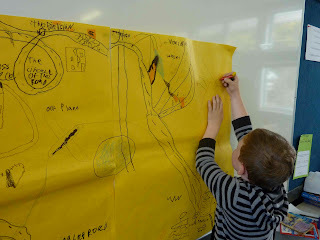 The description included a stream at the bottom of the mountain, a lake in the centre of town, bridges over to the mountain, forrest areas, shops, a school, a petrol station, and a number of other features. 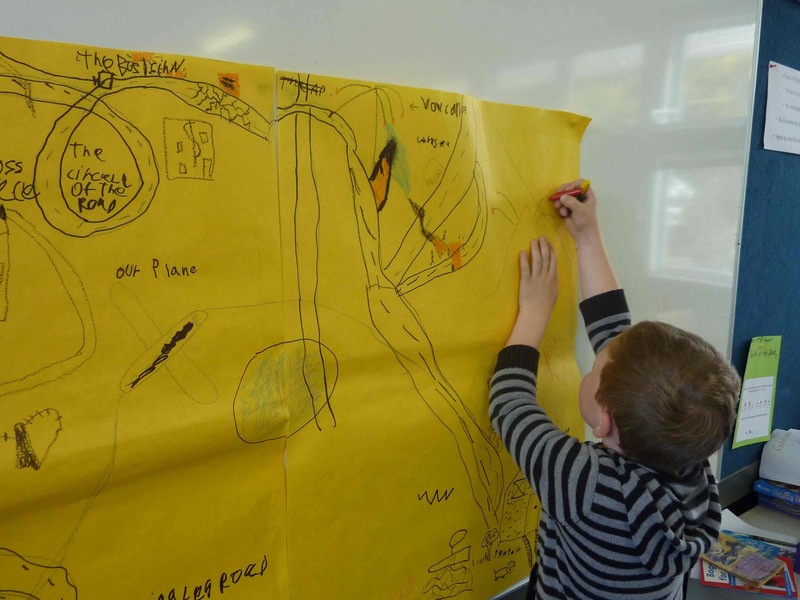 The children listened carefully to the description and then set to work on making a collective map of Thistle Town and some individual maps too. 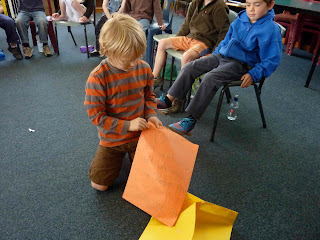 Next we went into role as 'The Problem Sovers' and we received a letter from the mayor of Thistle Town. We need your expertise help. 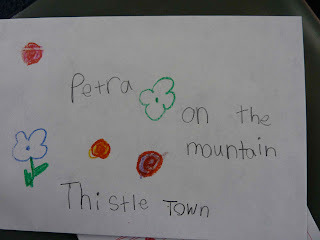 Our town has a mountain called Thistle Mountain and people have been hearing strange things happening up there. There have been people talking about seeing lots of broken trees and hearing loud roaring noises. Some people are saying that there is a giant that lives on the mountain and that he is causing all this noisy trouble. From the Mayor of Thistle Town. Reading aloud the letter from the mayor. 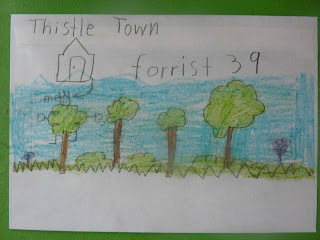 We decided we would travel to Thistle Town and help the mayor and townspeople. 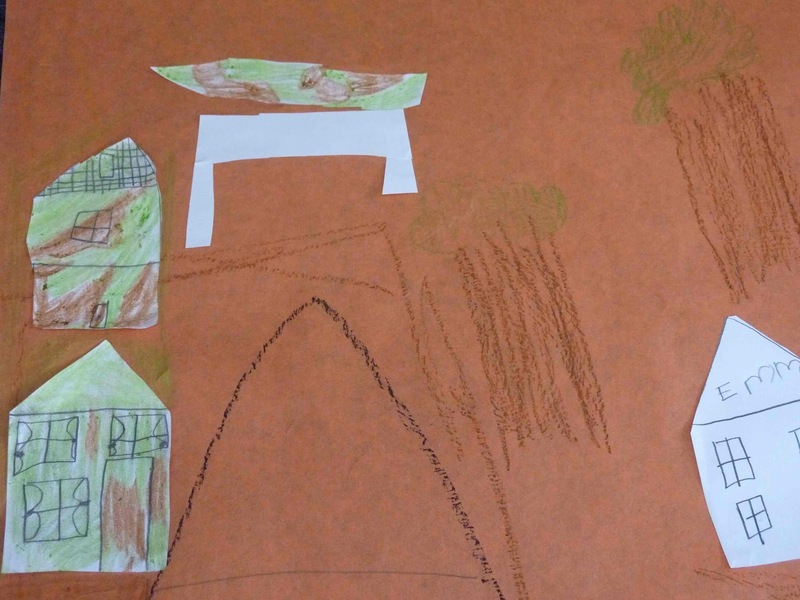 We added houses to our collective map to show where we would stay when we got there. Then we addressed some envelopes. Labels and houses added to our collective map. 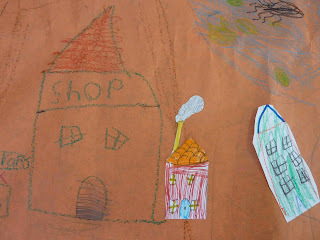 More houses by some shops. 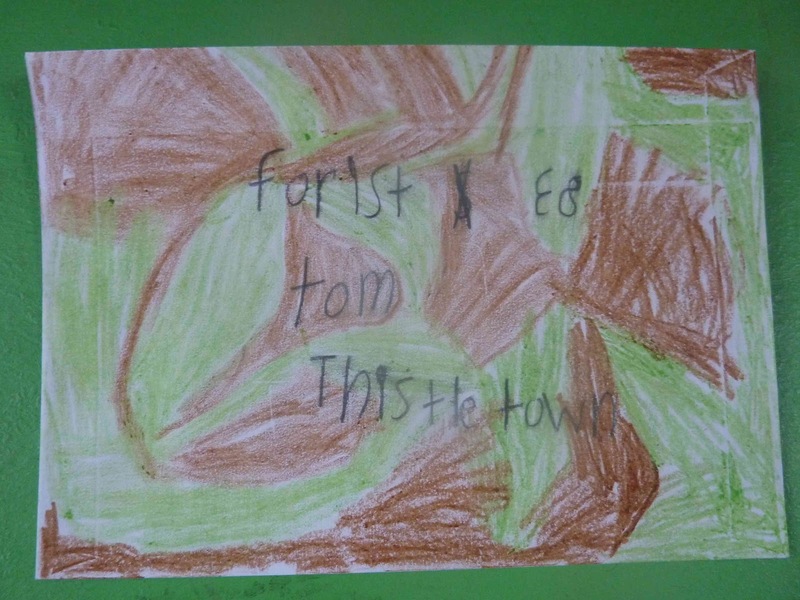 This envelope matches the camoflaged houses! 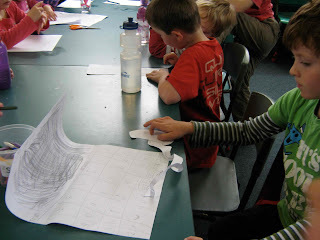 In role as 'The Problem Solvers' we discussed how we should travel to Thistle Town. 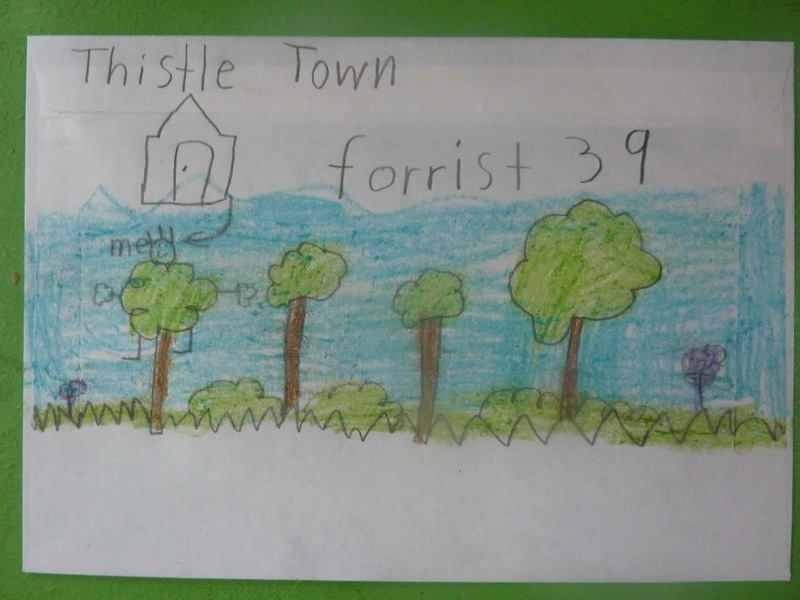 From the description of the town we had heard earlier we knew that Thistle Town wasn't on the main road and it was a very quiet place. 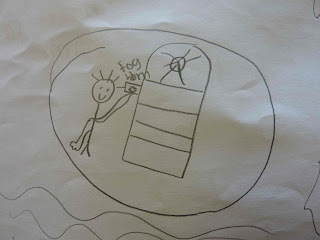 Petra suggested we travel by Hot Air Balloon and everyone thought this was a great idea. Myles and Tom decided they would take their private plane, since they had a landing base at Thistle Mountain - they thought that way they could guide the balloons also. We divided into groups to create hot air balloons using moving freeze frames - the balloons were very creative and looked great! 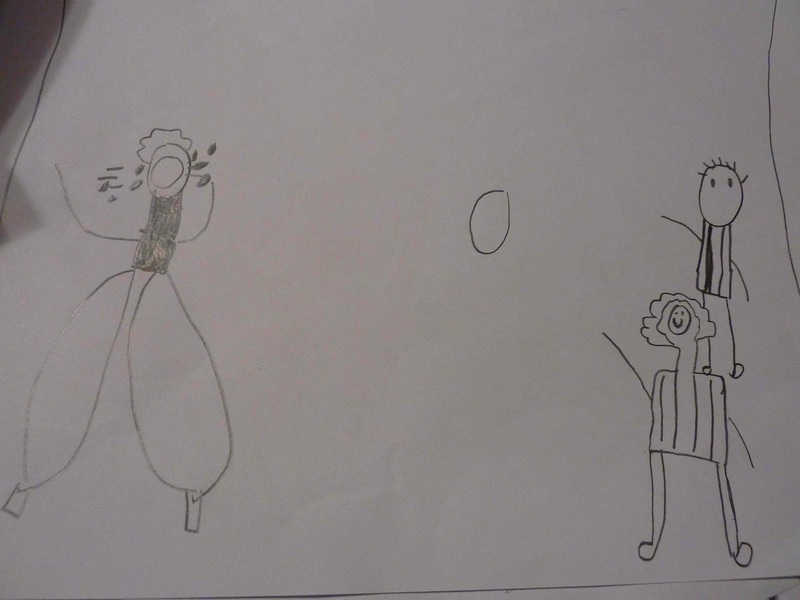 So four hot air balloons following a plane flew to Thistle Town where they were greeted by the mayor (teacher in role). The mayor invited 'The Problem Solvers' into a meeting where they shared their ideas about how they might trap or capture the giant. More detailed plans were drawn up and presented to the mayor so he could share them with the people of the town later. In small groups 'The Problem Solvers' discussed the equipment they would need and started to prepare their trip to the mountain to capture the giant. 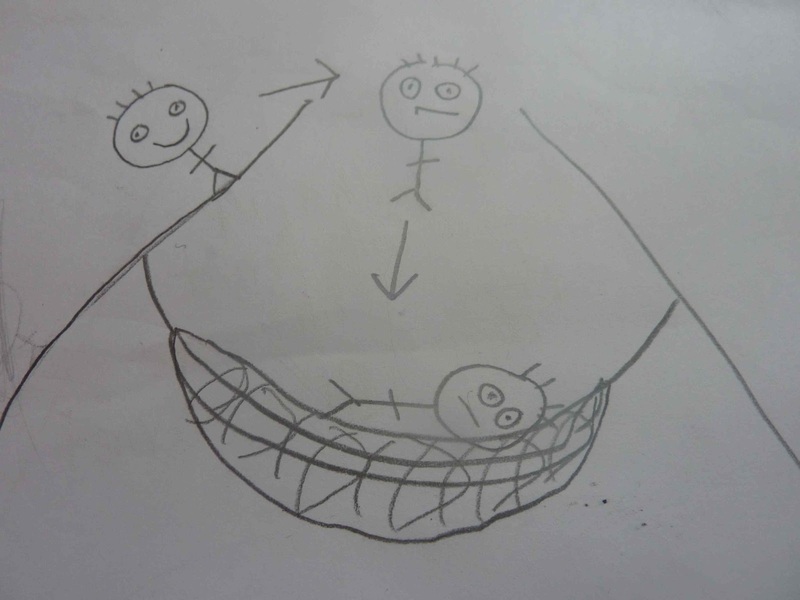 Trap plan to sing the giant to sleep. 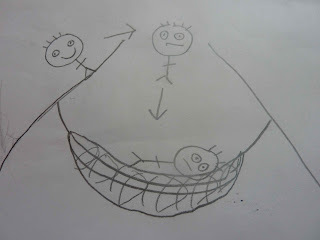 Digging a hole for the giant to fall into a net. Flying a plane over the giant to distract him and then dropping a net over him. A Problem Solver interviews a townsperson about what they have seen and heard on the Thistle Mountain. 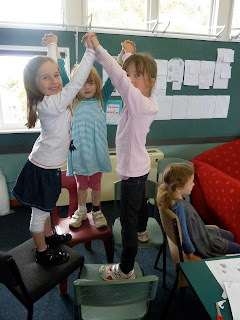 Our next activity was a drama activity where we worked in pairs. One partner went into role as a person of Thistle Town and the other partner went into role as a Problem Solver. The Problem Solver had to interview the townsperson to find out what they had seen or heard on the mountain. We swapped roles so everyone had a turn at being interviewed. To end the day we did some writing about what we had heard from the townspeople in our interviews sing the starter "I've heard the giant throws tantrums because...."
"he wants lots of money and gold and he doesn't like his cave"
"he is hungry and tired"
"he wants a new hair style"
"he can't do anything right"
"he threw a tree in his face accidentally and it is sore"
"he's angry and wants more toys. He's yelling and being annoying to the people of Thistle Town"
We are going to continue with this drama next week. Today we started with moving to music with ribbons. 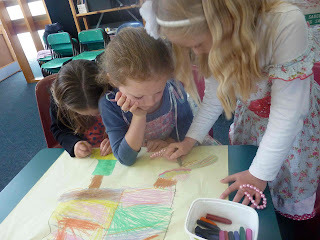 We listened to a range of different pieces and explored different ways of moving around the space, quickly and slowly. We then had a go at making up some dances, using our ribbons, in pairs. Some of these partner dances were very effective. Then we learnt a potato song! Our group came up with three favourite types of potatoes: buttered potatoes, mashed potatoes, and scalloped potatoes. We came up with an action for each of these and then walked around the room singing the different types of potatoes and doing our actions. The girls sang first and the boys echoed. 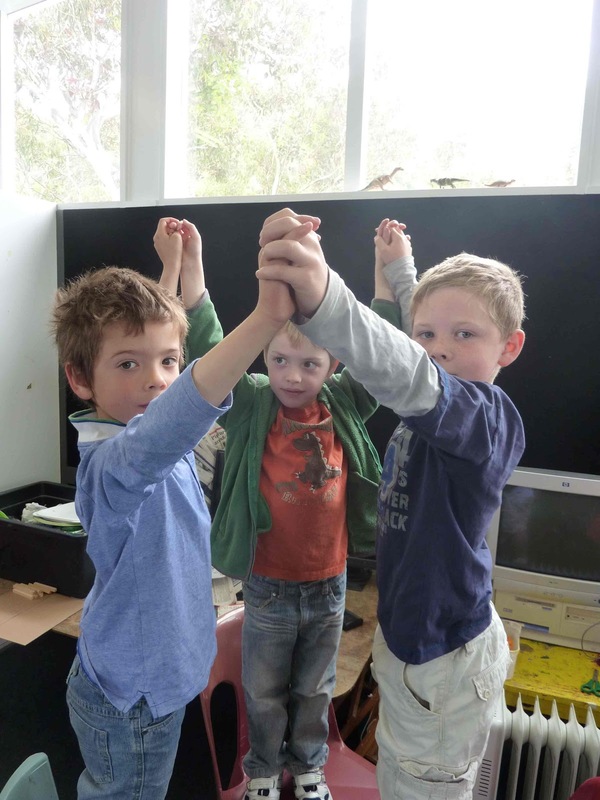 We then stopped and found a partner and we layered our hands, fist over fist, while singing “one potato, two potato, three potato, four, five potato, six potato, seven potato more…” then around the room we went again singing our potato song – lots of fun! We discovered that a lot of plumbers advertise that they work 24/7, so we talked about what this means. 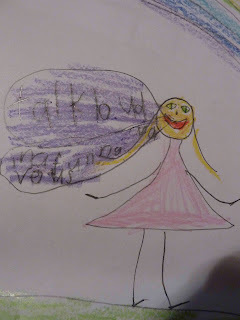 We talked about how ads can also be on TV and radio. 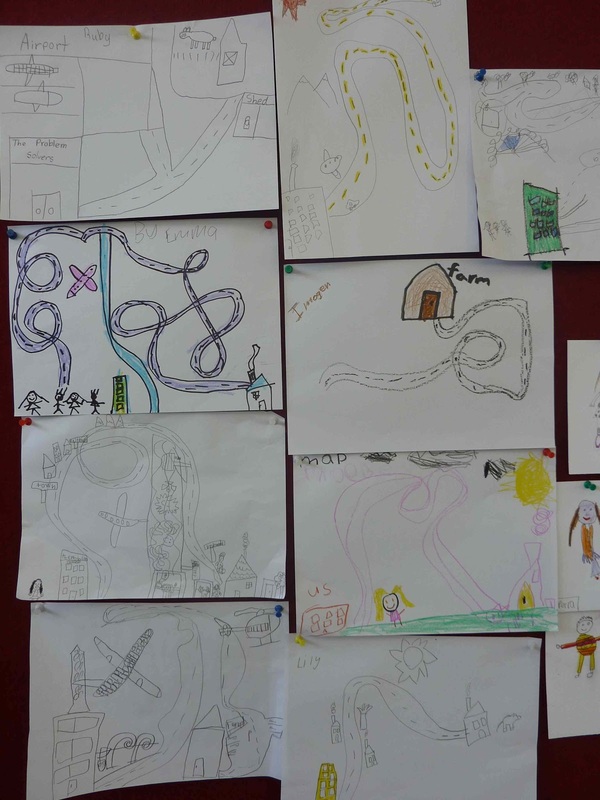 Some of the children also mentioned the idea of jingles and came up with their own jingles for our company – very creative! 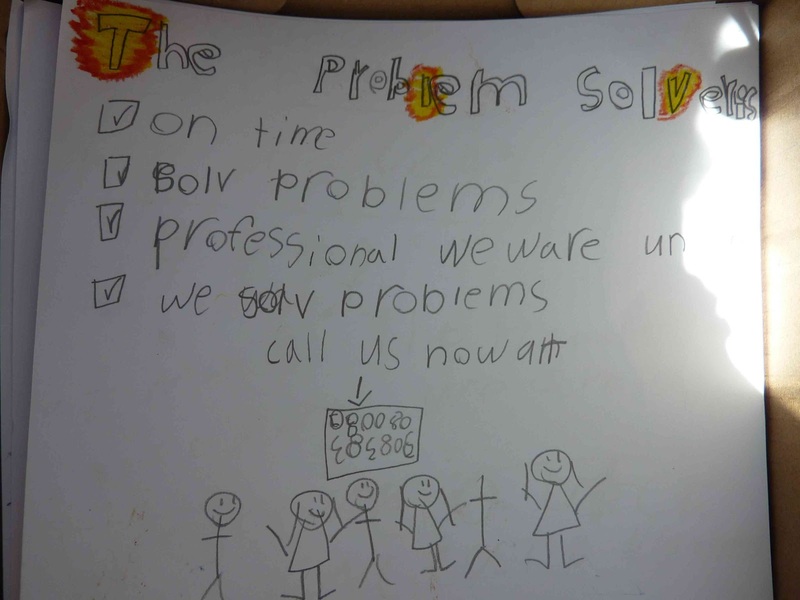 "call us - go problem solvers!" 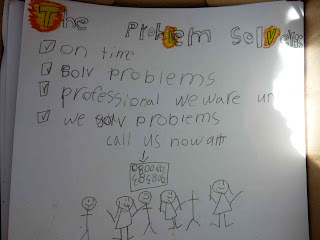 An Advertisment for 'The Problem Solvers - "professional we wear uniforms", nice use of tick boxes for bullet points. Use of 24/7, starbursts and a logo. Another advertisment with a web address! Problems? Problems? 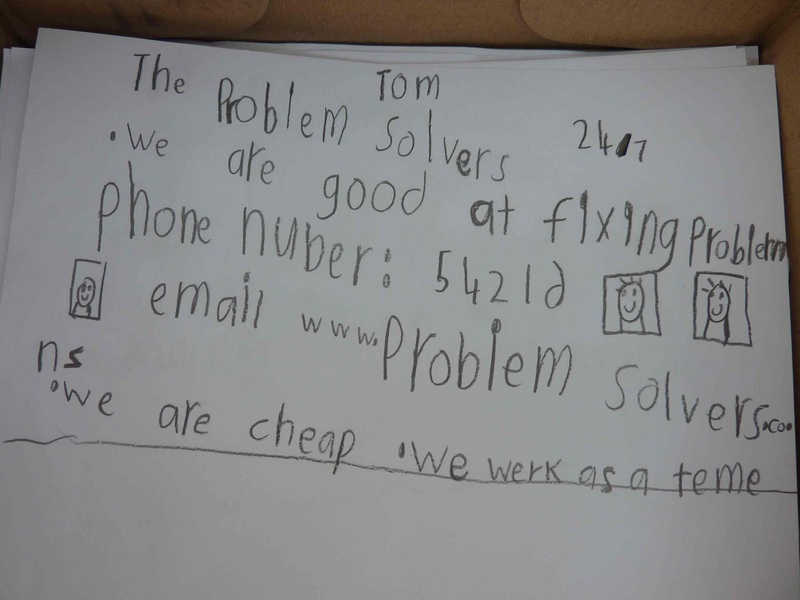 We can solve your problems! We are fast quality. 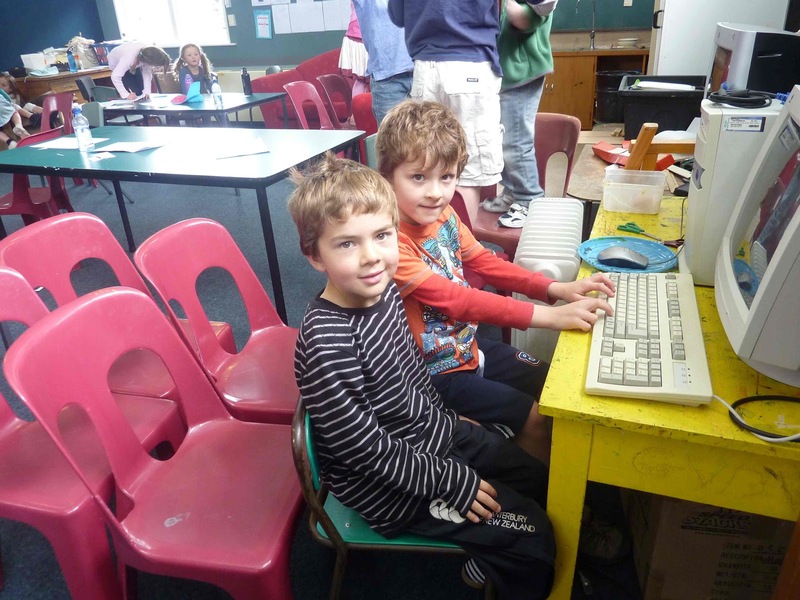 These boys put together a TV advertisment for our company: "Oh No! Who can help me with my problem?" To begin our drama work today we explored the contents of a mystery bag to see if we could get clues about who the things belonged to. There were come baggy pants, a hat with a flower on it, three tennis balls, a big bow tie, and a red nose. We all quickly guessed that they belonged to a clown. We then talked about what clowns do and some of the children shared stories about seeing a clown in a circus or show. 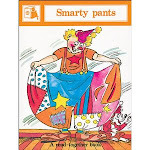 We also read some clown stories to set the scene: ‘Olivia Saves the Circus’ by Ian Falconer and ‘Smarty Pants’ by Joy Cowley. Mystery Bag: Who do you think these things belong to? 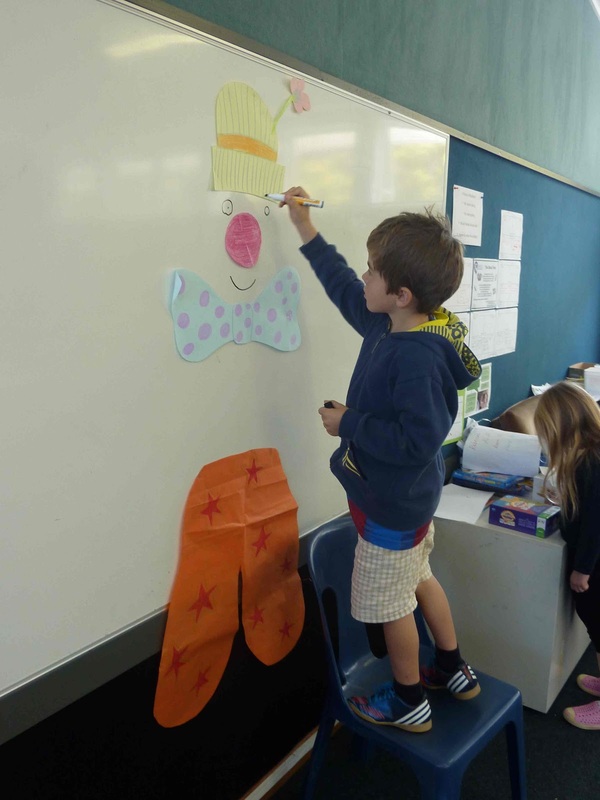 For our drama we then put the items from the mystery bag onto the wall and collectively created a clown character. HELPING A SAD CLOWN WHO CAN’T MAKE PEOPLE LAUGH! walking backwards, bumping into another clown and falling over. 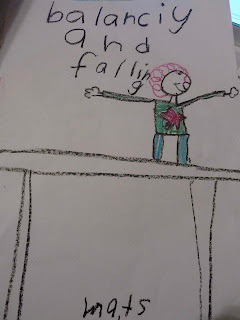 "how to balance and fall"
"funny faces make people laugh"
"Talk loud and in funny voices"
"throwing and catching (and missing!)" To finish our story of the clown we did a drama activity known as a ritual. For this we each had a turn to stand up and present our clown with our instructions and pictures and spoke aloud a message for the clown. This was a lovely way to finish the days work. Ritual: "Good luck for your performance Mr Clown!" To get warmed up today we started with our African Ghana song 'Jambo'. We had a go at singing it as a canon, which worked really well - this song has quickly become a favourite with this group! Our claves made a sun and we sang and danced around it. 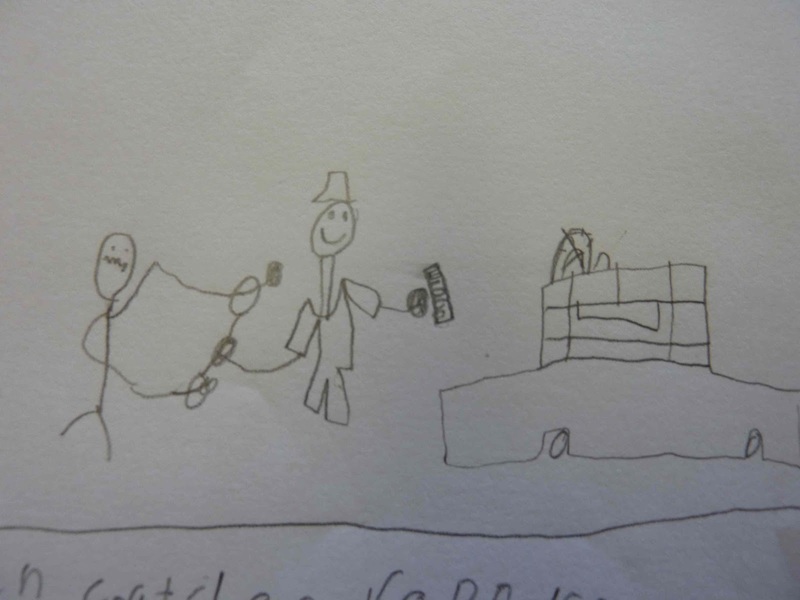 To begin our drama work today we received a thank you letter from Charlie Grinling, which was fun to open and read together in-role as 'The Problem Solvers'. We also reflected on the qualities of our team that made our company so successful. 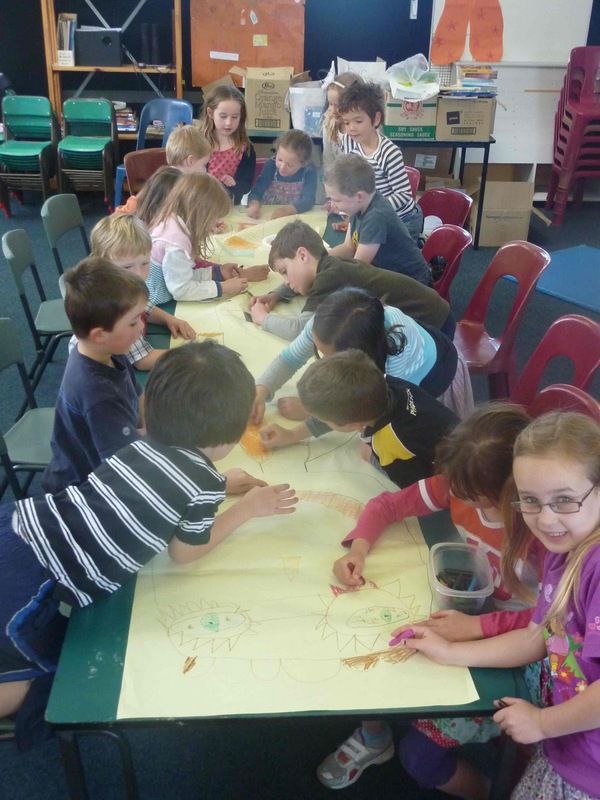 Thank you so much for all your help last week. 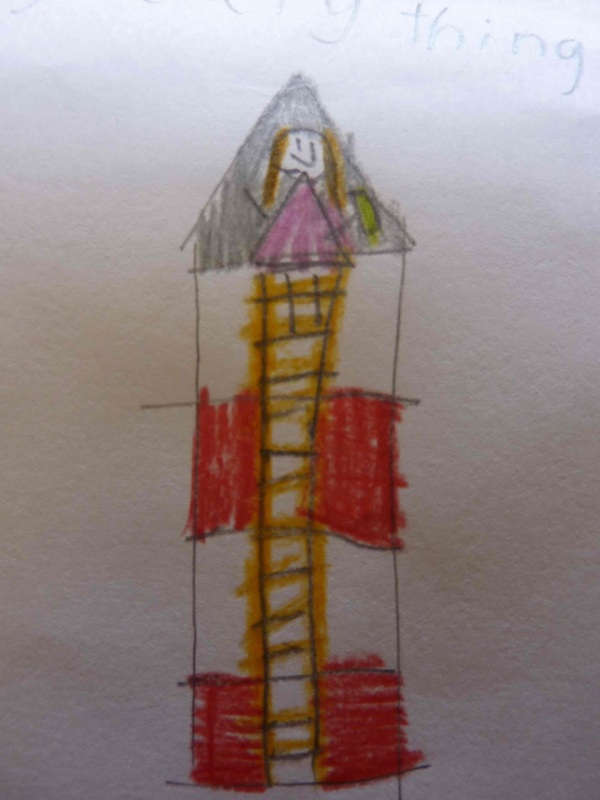 Mr and Mrs Grinling are back from their holiday now and they were so pleased that the cottage and the lighthouse had been so well looked after. They were so happy to come home to a beautifully clean house, a healthy looking garden, and a very happy cat! They were also relieved that all the ships had been able to travel safely with the bright polished light shining out to sea. 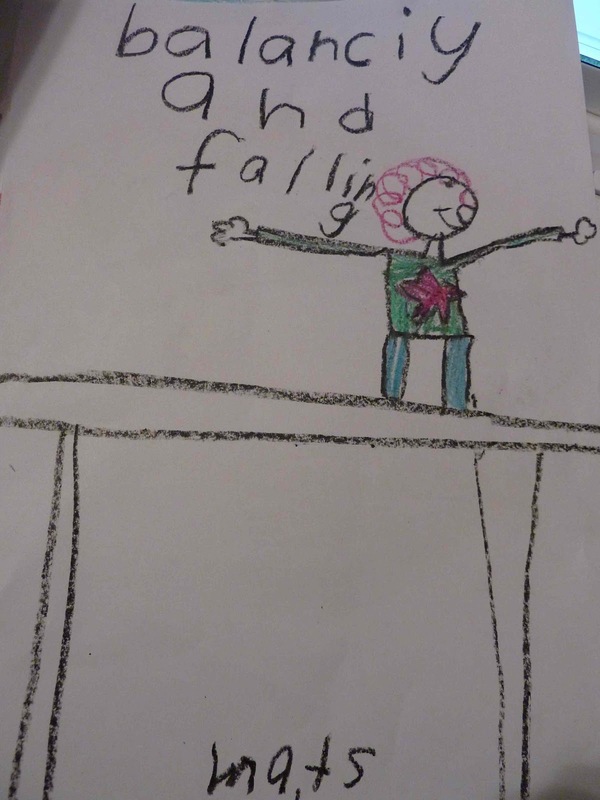 I told them all about how you visited me and came up with such a good set of instructions. I also told them that it was you all who stayed in the cottage and did all the cleaning, gardening, and cat feeding, while I got the work done in the lighthouse. Mr and Mrs Grinling are very impressed with your high quality work and your superb problem solving skills. I was also very pleased that you were all so friendly, kind, and helpful when you came to visit and stay at the cottage. You are all very good listeners and have great manners. You are also great lunch makers! Thank you, I have told my friends all about your great company! 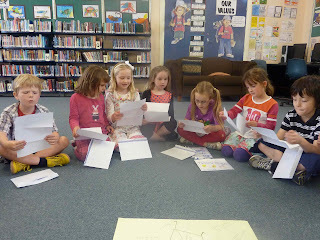 Opening our letter from Mrs Macdonald. "it is a very twisty road"
"there are roadworks here....and a forest filled with robbers"
"we can go in our plane"
"we are going to have a tricky path over an active volcano but also not hitting this mountain here...."
"lets stop at the lolly shop and get a lollipop on the way....we will need to stop in Longs Town"
The children set up a plane with chairs. Tom and Myles volunteered to be the pilots (providing a very detailed exciting commentary of our flight over the volcanos and robber filled forests etc), Cameron and Ned delivered food and drink throughout the flight, and Emma was our leading air hostess providing a wonderful safety demonstration and reminded us several times during the flight when we needed to return to our seats due to turbulence (going over volcanos can be quite bumpy!). 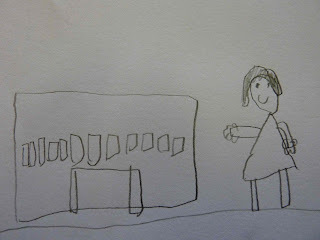 There was also a quick landing made to stop and get lollies from the lolly shop organised by Ruby. 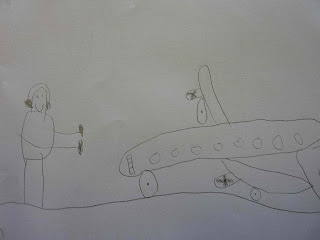 The spontaneous improvisation during the flight was very impressive and all the children stayed in role very well. The team on the company plane. 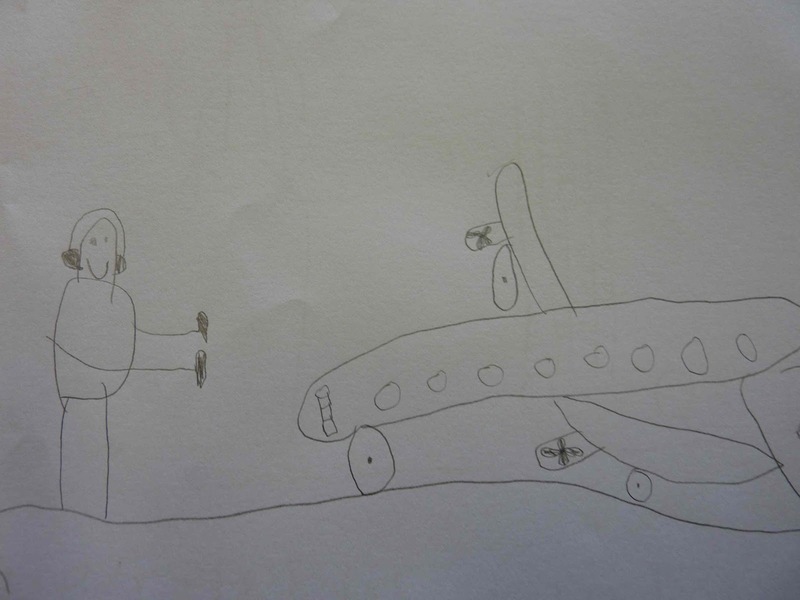 Emma ended our flight with "Thank you for travelling with Air Problem Solvers. 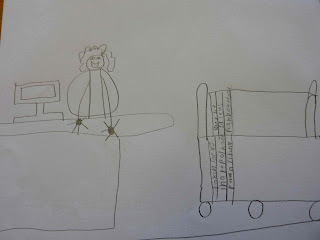 Please make sure you take all your belongings with you...." Great in-role work Emma! We finally made it safely to Mr and Mrs Macdonald's farm. We were welcomed by Mrs Macdonald (teacher in-role) and she took us to the shed where Mr Macdonald had locked himself in. 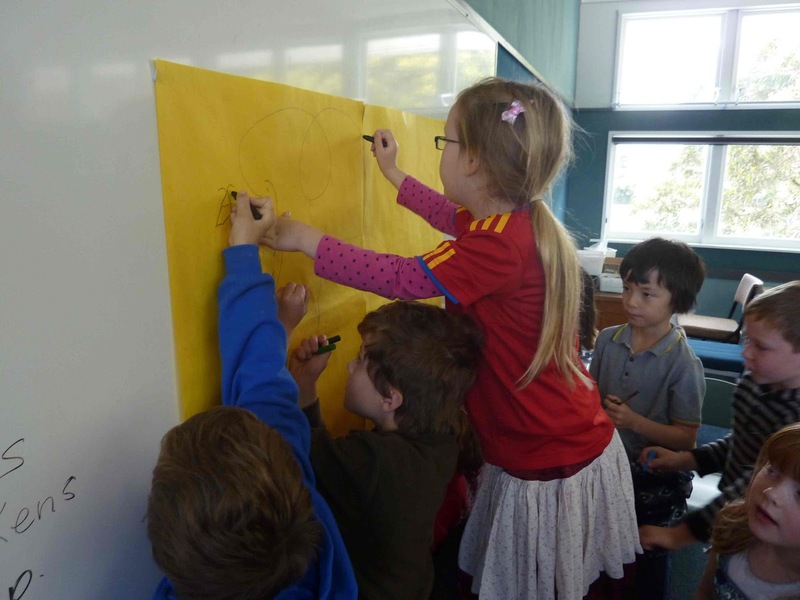 The Problem Solvers took it in turns to ask Mr Macdonald questions while Mrs Macdonal relayed his answers. 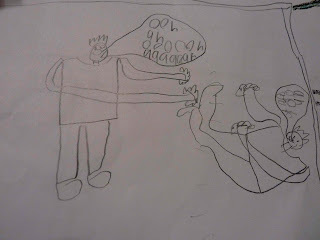 It took quite a while to find out that the animals were making too much noise for Mr Macdonald. 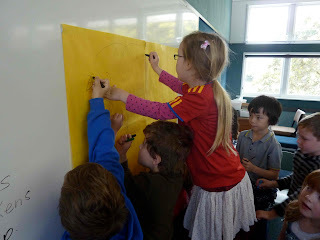 We had to really think hard about the kinds of questions we were asking to get the information we needed, and we also had to listen carefully to catch any clues....Mrs Macdonald was very shy and worried too so we had to be very kind and gentle, and use our manners. 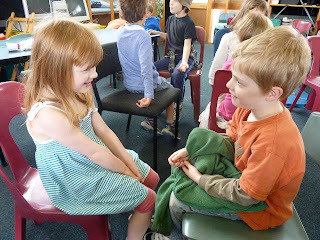 The next part of our work was interviewing the animals to find out why they were making so much noise. 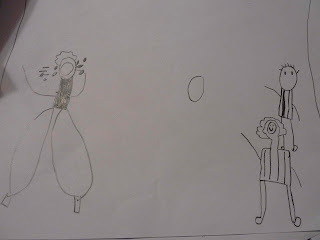 For this part of the drama the children became the different animals. We had a group of ducks and one rooster, a group of horses, a group of pigs, and a group of sheep. CJ was in-role as one of The Problem Solvers and he went around the groups, with Mrs Macdonald, and interviewed the different groups to see what was wrong and why they were making such a noisy fuss. 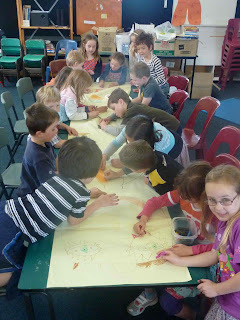 Each group decided on what they were fussing about and CJ and Mrs Macdonald made notes to report back to Mr Macdonald. The animals were indeed very noisy and fussing about all sorts of things. Some wanted more food, different types of food, bigger pens, more entertainment - perhaps a juggler or even a TV in the pen....Back in-role as The Problem Solvers the team decided they would stay on at the farm for a while and help Mr Macdonald get everything sorted so the animals would be happy and quiet once again. Another problem successfully solved by The Problem Solvers, well done team! Today we came together for the first time as a group of 5 and 6 year olds to do music and drama. We began our day with singing and clapping our names in a circle and then sang and played different percussion instruments to a song called ‘Listen to the Music 1, 2, 3’. 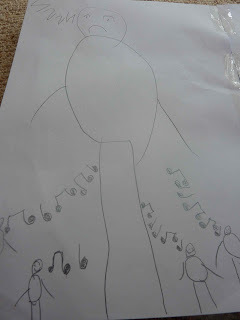 In these activities we watched and listened carefully to each other and took turns to play our different musical parts. We also learnt an African welcome action song from Ghana. We discovered we are quite a musical group with a couple of us already learning instruments – we have 2 violin players in our group! 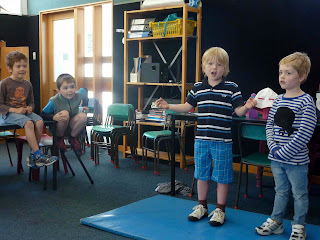 Next we talked about drama and what that is. 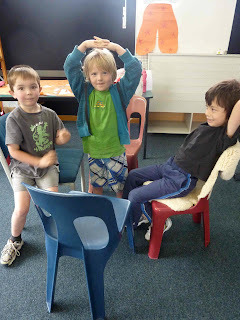 We agreed that doing drama is when you pretend to be someone else just like when we play. Everyone shared their favourite type of play when they pretend they are someone else. 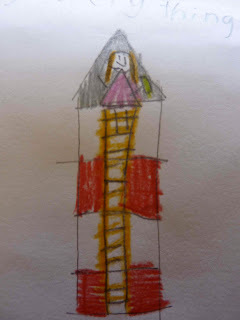 Some of the group’s favourite activities were playing mums and dads, playing spacemen flying rockets, playing shop owners and assistants, playing vets, and playing pets and their owners. 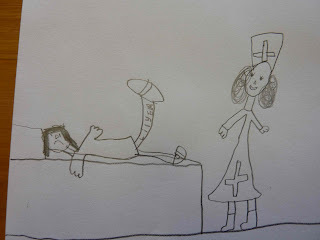 Next we talked about for our unit of work we are going to be doing some drama about people who help other people. Everyone brainstormed ideas about people who help others and we drew pictures of some different types of helping people including: vets helping sick animals, Sue and Carole in the office, piano teachers, horse riding teachers, doctors, policemen, Sue in the library, firemen, karate teachers, and Mark our caretaker. 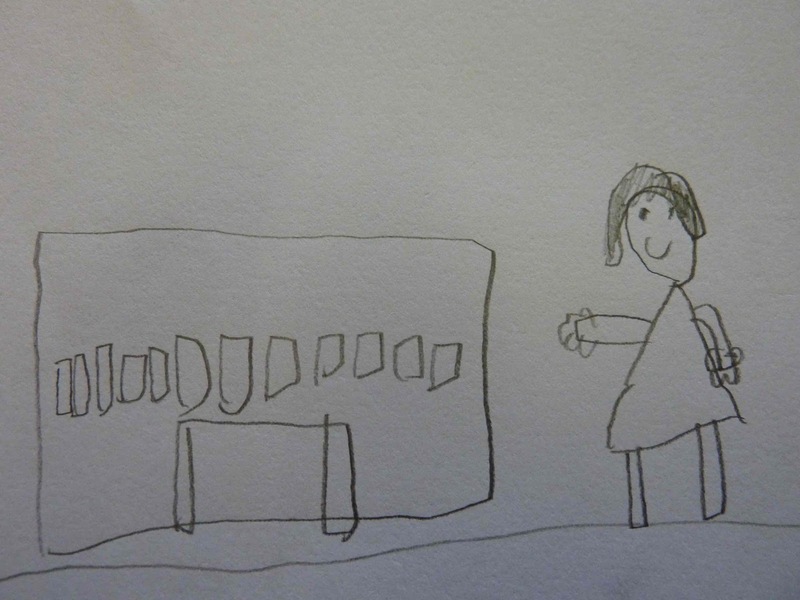 "my piano teacher helps me"
"a policeman catches robbers. They keep our place safe"
"pilots help people travel safely"
"Sue helps us find our books and issues our books"
WHAT WOULD PEOPLE WHO WORK IN A HELPING COMPANY DO? -Good at creative thinking so they can help come up with different ways to solve problems, maybe in a better or faster way. -Good at listening to what the problem is. -Good at noticing if someone needs help. 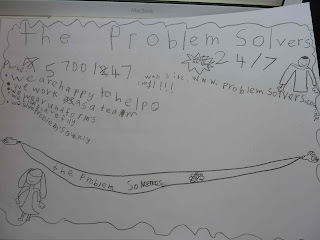 ‘The Problem Solvers’ got the most votes, by a clear majority, so that is what our fictional helping company is going to be called. 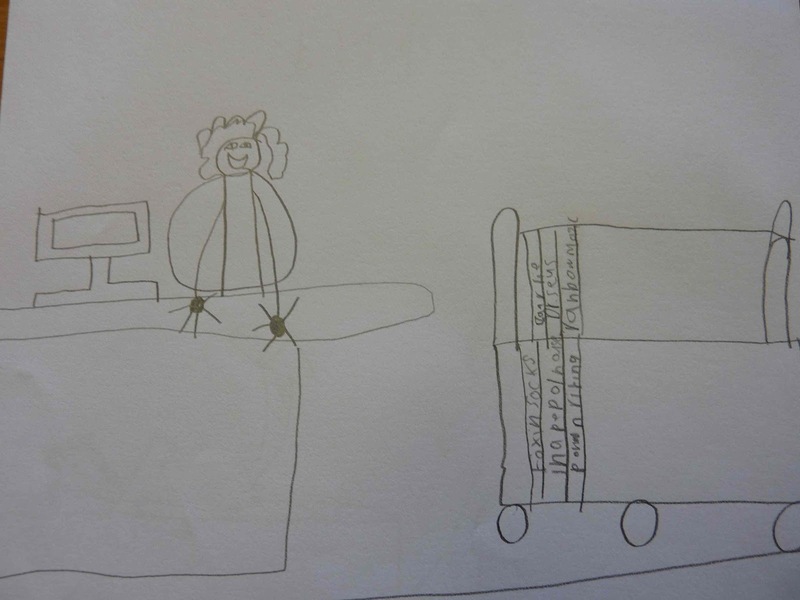 The children together built a beautiful picture of our company work space, we were all becoming quite excited about working in the golden building with the rainbow coloured couches! 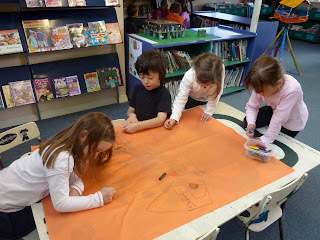 Next we added signs to the classroom space so we could start to take more ownership of our space. 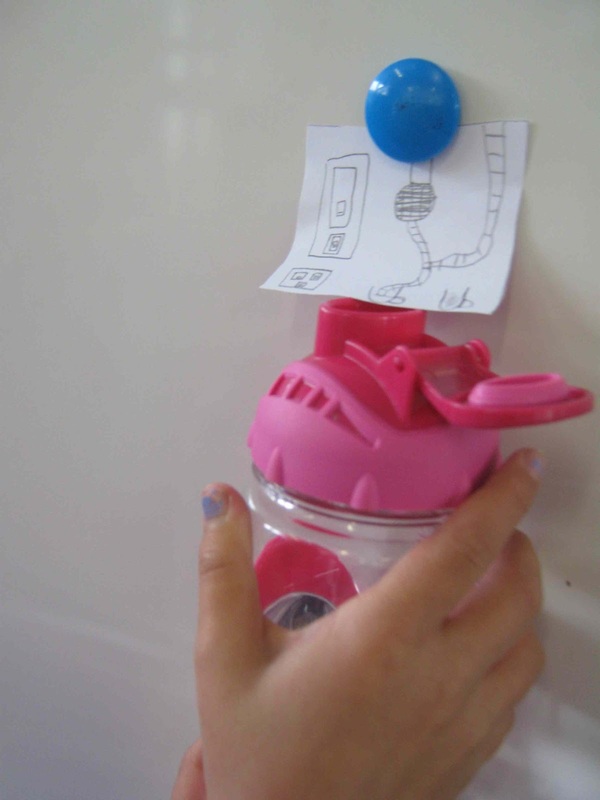 The children drew pictures of bookshelves, computers, ipods, phones, security lights, and even an ice-cream sundae maker that also made coffee and juice…later on in our work this ice cream sundae maker also had the ability to show us on a map where anyone was in the world if we needed to find out – very useful! A sign for our door. We received our call from Charlie Grinling on this phone. We were ready to go into role as workers in our company. We sat down at a table and had our first meeting. 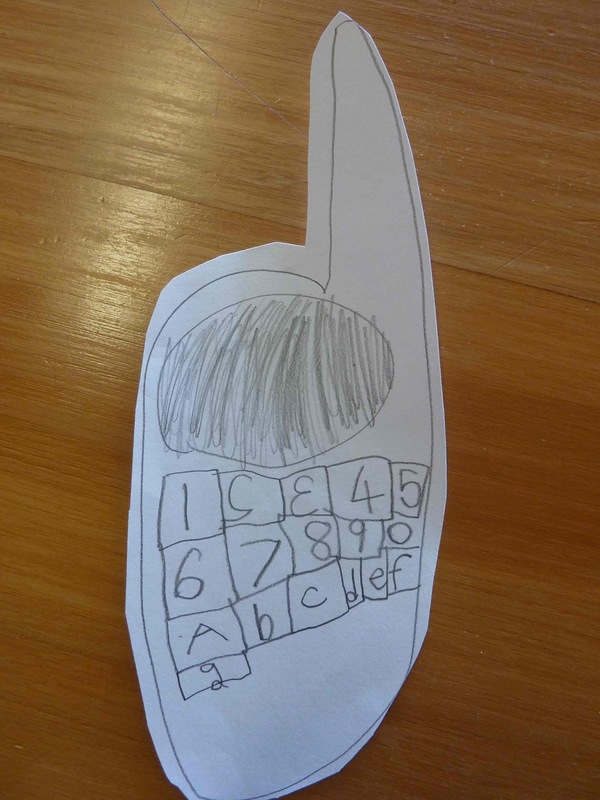 One of the phones (that one of the children had drawn) rang and it turned out to be Charlie Grinling, Mr and Mrs Grinling’s (from the Lighthouse Keeper’s Lunch book series) nephew. Making a moving image of a lighthouse with a moving light and foghorn. This moving image had a spinning light at the front! 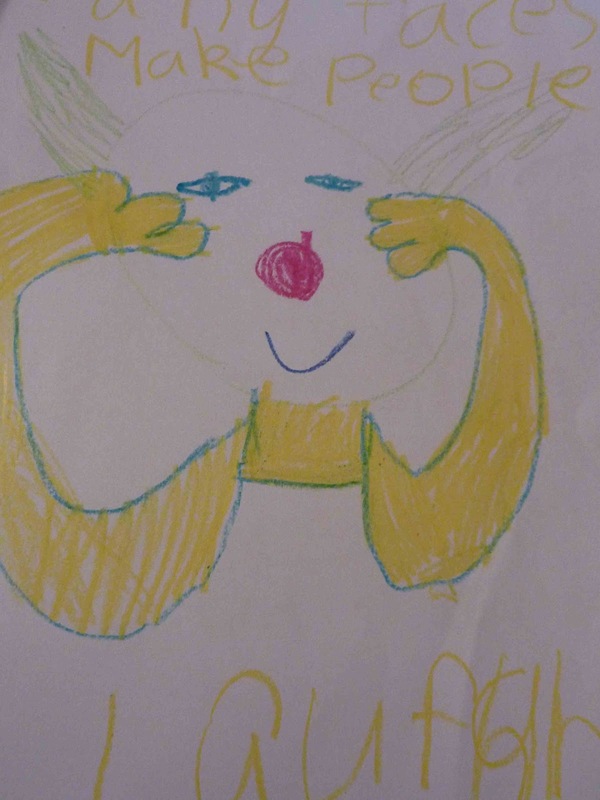 Our company, The Problem Solvers, made a new set of instructions with pictures for Charlie. We packed our company van with sleeping bags and lots of other useful things, like food for the cat, so we could stay at the white cottage and help Charlie look after it. We visited Charlie and showed him all the instructions and explained what to do. 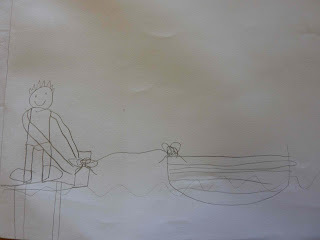 In role we cleaned the white cottage, did the gardening, fed the cat, made Charlie lunch and sent it in the basket down the line, helped Charlie polish the lighthouse light and put it on with the fog horn. 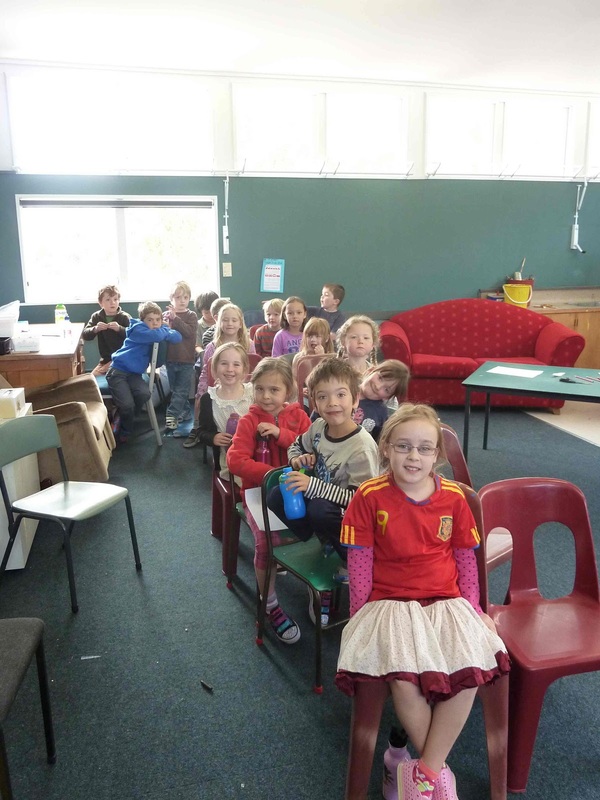 We had a lot of fun playing in the drama and everyone stayed in role really well. 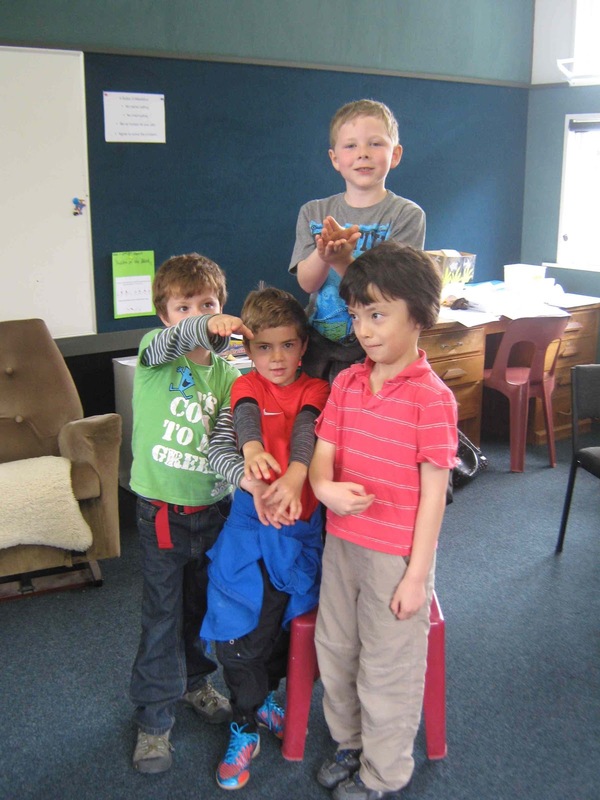 The creative thinking and collective team work in the drama was fantastic. One child's brainstorm plan of how we could help Charlie Grinling. "you need to clean and polish the light and dry everything too"
"We can look after the garden at the cottage, and fix this window that is broken!" 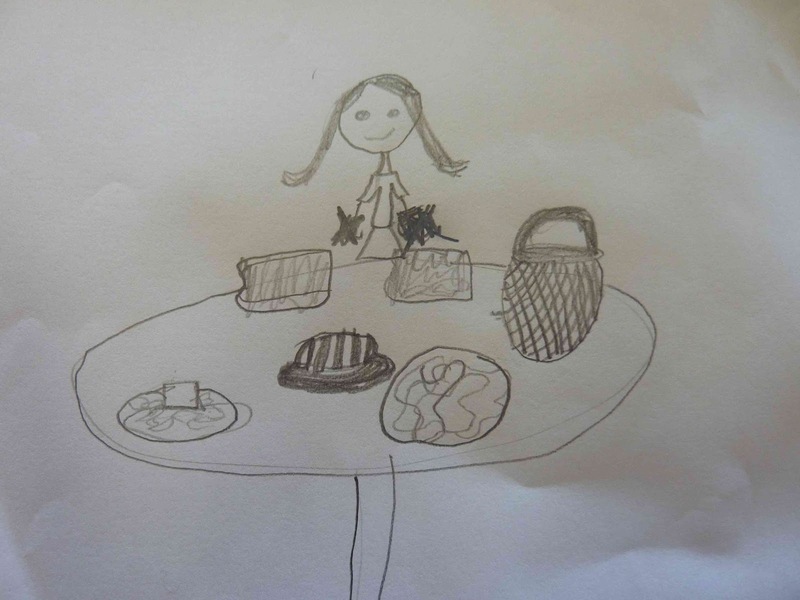 "We will make Charlie's lunch for him and send it down the basket to the lighthouse!" 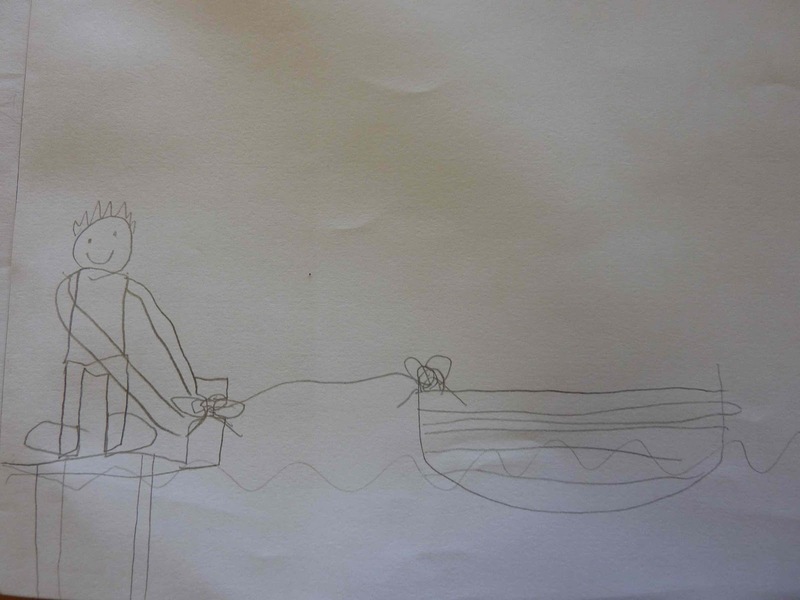 "Remember to tie up the boat so it doesn't float away!" We really enjoyed our first day as ‘The Problem Solvers’, I wonder who our next client will be? 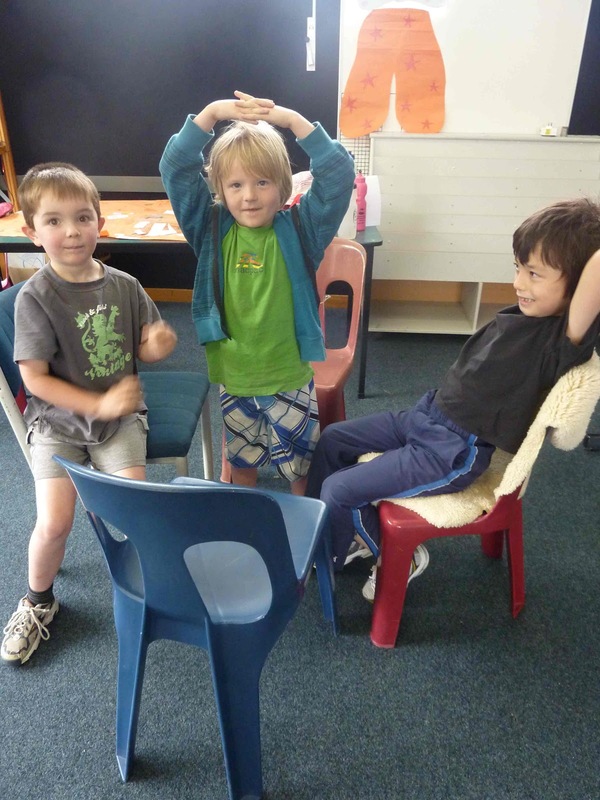 Music specialist at Eastern Hutt School teaching with the Orff Schulwerk approach. Currently working on a Masters of Education specialising in arts based learning and teaching in the school of Education at Victoria University. Wellington representative of ONZA (Orff NZ Aotearoa) and an ONZA educator/levels presenter. Particular interests: creative play based learning models, inquiry learning with drama and Mantle of the Expert, Music Education: Orff Schulwerk approach - Level 3 ONZA certified.